Growing up, I LOVED corn dogs, but then again, I think every kid loves corn dogs. Why do kids love these things so much?! My family and I came to visit my parents for a few days. My kids love visiting with their grandparents and also love hanging out with their aunt and uncle who are still very young and live at home. I love visiting my parent’s house, because it still feels like home and the smell of my mom cooking floods back memories. I have mentioned this before but somethings are just worth repeating. Growing up, and still to this day for my youngest siblings, my mom always had/has an after-school-snack ready for the kids when they walk in the door. It is something I plan to do for my kids when they reach that age. I would often look forward to getting home from school purely to see what my mom had made us that day. She would take requests and surprise us and they were always delicious and the perfect thing to walk into from a long day. My ten year old brother is obsessed with corn dogs. He can’t get enough of them. He had put in a request for HOMEMADE corn dogs and my mom and I were excited to give them a try. We came across this recipe at AllRecipes and came to find that surprisingly, they are SUPER easy to make and leave smiles all over the kids faces, my two picky eaters included. If you have a corn dog lover(s) in your family, give this recipe a go! You will become the “coolest” person in the world to your cute kiddos! You will be blown away by how simple and quick these whip up! They are delicious and make the perfect after-school-snack! In a large bowl, combine cornmeal, flour, salt, pepper, white sugar and baking powder. Add milk and egg to the bowl and whisk well. Heat oil in a large pot on stovetop until it reaches 350 degrees F.
While oil is heating, insert wooden skewers into hot dogs. Dip/roll skewered hot dog into batter until completely covered. Cooking 2-3 corn dogs at a time, cook in oil until golden brown in color, about 3 minutes. Set on paper towels once cooked to drain off any excess oil. Corndogs are seriously one of my favorites!! These look perfect!! PS. I love your blog and all of your recipes! My kids would die if I made these! Great photo by the way! I was such a sucker for corndogs when I was a kid. Can't WAIT to try this homemade version!!! oh my gosh. i love corn dogs. can't wait to give this recipe a try and make my own! I LOVE corn dogs, definitely one of my favorite foods, although not something I eat very often. These do sound simple and delicious. The only downside is I hate frying..it sorta scares me, plus it's messy. But it might be worth it for some of these! 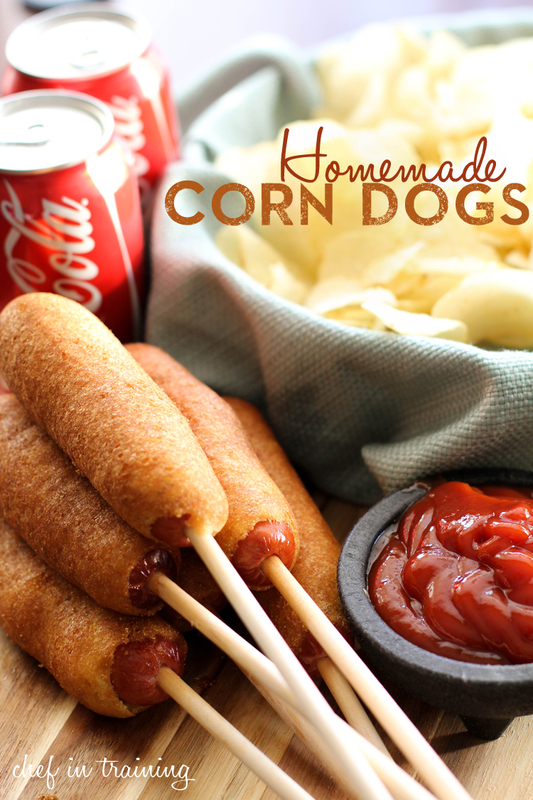 I love a good corndog, and these sound so fun to make at home!! Gorgeous pictures! omg! i love corndogs! these look delish! What a great shot!!! And I love how easy these are to make...I had no idea!!! I found that putting the batter in a tall drinking glass I was able to dunk the dog in and out with no problem. They were delish. Thanks for the recipe! They look delicious, I love corn dogs, but the easiest recipe I ever made, was 2 boxes of cornbread mix, cut up hot dogs and bake, delicious. Corn dog muffins. So good, so easy!!! Thanks!!!!! Wow, I tried making corn dogs ( my son's birthday dinner request). They didn't come out like yours. Will try this one next time. I love corn dogs and these look so good. Just looking at them brings back wonderful memories. I can almost taste them. thank you so much! I was just thinking I need to find a corn dog recipe. my kids have been addicted but I hate feeding them what's at the grocery store as often as they want them. now I can make cheese sticks and maybe hide some veggies dogs in there too! I made these tonight because Friday night meals are usually fun and less formal than during the week. They were a huge hit with all of us. Because I didn't need to make 16 I just cut the recipe in half. There was plenty of batter. This recipe was simple and lots of fun, but most of all the corn dogs were delicious. Thanks for a really fun great tasting recipe. I will definitely make them again. I made these for lunch today after my husband saw the recipe over my shoulder last night. I dropped the milk down to 1 cup and added a 2 tablespoons honey. They turned out fantastic. My only other change was to cut the hot dogs in half - that way I could use a smaller pot and half the oil listed. Not an everyday recipe, but it was a hit for a special treat and I will definitely make these again. Do you know if I could get away with making these without the skewers? That's one thing I never have on hand. Where would you find skewers at the store? I make mine without skewers. They turned out perfect. skewers will be in the utensil aisle. Most grocery stores have an aisle where you can get measuring cups, spatulas, etc. It should be there. I have found them at the dollar stores and I am relatively sure the craft stores and grocery stores would have them. Ask. We made these today for lunch and they were absolutely delicious! My husband says he will never eat a boxed corn dog again. Thanks for posting a wonderful recipe, I am looking forward to trying others on your blog! This is one of our favorites when the grandchildren come....save yourself LOTS of heartache by pouring your batter in a drinking glass and dip the skewered dog into the batter in the glass....quick and easy! Jason would love these! He's always eating the frozen Trader Joe's corn dogs! Wow! I can only IMAGINE how much money you are saving by doing this yourself. My family eats corn dogs all the time (hubbys favorite acutally) and it adds up so quicky to be 7-10 dollars for a box. I have to give them a try and see what he thinks. Found on pinterest! I made these tonight, as a treat for my boys, they were awesome. I cut each hot dog into three and made mini corn dogs. I also followed some of the tips and used honey instead of sugar and a bit less milk. I used a chip pan and for each serving I put a hand full of chips into the basket first and then 6 mini corn dogs.. It was a great meal and one we will make again (but not too often since it is a treat.). I made these to the joy of my family. They came out perfectly!! I had some leftover batter, so I made some with cheese sticks. They tasted like grilled cheese sandwiches on a stick. Yummy. Thanks for the great recipe!! I cant wait to try these! I am making the for lunch but just for myself so i have to cut down the recipe. Made this today for my 7 years old son. He went crazy helping me. We had a lovely time and a great lunch! They tasted really good! Thank you! Here's another trick that I use; pour the batter into a tall glass or Solo Cup to make dipping the hotdog easier. ......also rolling the hotdogs in some of the dry Cornmeal first allows for the batter to stick better. These were so fun to make! My kids loved them, and they had a blast helping me. Thanks for sharing this! For the skewers - I've read you can go to an asian/oriental store and get chop sticks for really inexpensive and they are not as "pointy" as the skewers you can get at a grocery store. I've been looking for a recipe that doesn't use buttermilk and I'm happy I found one! :) thanks for posting. Stupid question here, but do you put the whole thing in the oil, stick and all, or do you try to keep the stick out of the oil? Thanks! We love corn dogs, too, tried a different recipe, but had troubles. Thanks for the tall glass and rolling them in corn meal first tips. What do you use to deep fry them in? a deep fryer? a cast iron pan? Someone asked the question I had but I didn't see an answer: How do you fry them with the skewer in? standing up? that would take a huge amount of oil. Laying down? in what? how much oil? I'd like to try this again, but need answers to those questions first. If I don't get answers to these questions, may try mini-corndogs without skewers. I wait your reply. Thanks. You use a deepfryer and u you use 1 quart of oil as it says in the recipe and I believe you would lay the hot dog down to put in the skewer. If you dry wieners and roll in cornstarch (shake off excess) before dipping in batter, the batter will stick much better. Got this tip from Emeril. I made these and they didn't even look like corn dogs! The batter came off and floated to the top. Any suggestions for next time??? My batter was a very thick paste. I had trouble making it stay on the hotdog. I added more milk and still wouldnt hold onto hotdog. I tried molding it submerging the hotdog and stuck it in the pan of oil, it all fell apart. My hungry grandbabies are looking at me with hunger so gotta think fast. Added more milk so a total of 2 1/2 cups I ended up using. So I just battered the hotdogs the best I could n put them in the oven. The look awful....like little turds. Ugh, sorry this was not easy I did exactly as the recipe instructed. My mom used to make these when I was a kid. She boiled the wieners first to get the excess grease out then dried them off with a paper towel before frying. She scrambled her eggs with a spoonful of mustard before adding it to the cornmeal mixture. She also did not add sugar, salt, or pepper, since wieners are usually salty enough. Hers were soooo delicious! If you flour the hotdog first it will stick. Hi nikki, my name is vivi from Indonesia. I want to ask you about cornmeal. Is it same with cornflakes? no its not. It is a course flour ground from dried corn. Has anyone tried self rising corn flour? Hi! I'm from SA and I make these all the time now :P absolutely delicious!!! I made these yesterday and they were so DELICIOUS! Can I refrigerate or freeze the left over hotdogs? I'll have to try this recipe out! My kids love corn dogs. I know they are so simple to make too - I just never get around to it. I learned to put the batter in a tall cup to dip, makes it so much easier. Forgot about these, will be making them soon again! Thanks for sharing. if you put the batter in a tall glass you can dip all the way up the hot dog for a good coating yummy!!!!!!!!!!!!!!!! This recipe is great! The only thing that I'll do next time is boil the hotdogs a little first as they were still a bit uncooked on the inside. Did you have any troubles getting the batter to stay on the hot dogs? I tried corn dogs once, just using a corn bread mix, and what a mess! All the batter slid off the hot dogs into the oil. I LOVE corndogs for myself, but I always have a problem with keeping the batter on thd dogs, no matter what recipe I use!! Tips? Suggestions? Thanks!! Making these for dinner. My kids loved them the first time we had them. TIP: throw a unpopped corn kernel in oil, when it pops, it's 350 degrees! I had so much fun making these with my kids. They didn't like them after all the effort, of course! My husband and I enjoyed a couple but the longer the corn dogs sat the heavier the breading became, leaving a heavy, greasy feeling in our tummies. It was my first time frying anything so I'm sure that was a factor. Thanks for the recipe, though! What can i use instead of corn meal because i cant find any corn meal around here. You could even make these as little corn dog bites by cutting the hot dog into bite size pieces and dipping them in this better and throwing them in the oil to cook. Great for little ones or make a bowl full and everyone just grabs want they want. I can't wait to make the corndogs for my family as they have never had one. We live in Lincoln England me and my wife visit family in Denver Col so we know how good they are, and now thanks to you so will all the family. I will let you know what they think. Want to ry, but if using deep fryer how do you hold them if doing more then one. Thought it would be a nice fundraiser. Need to do them fast to keep up with demand. Could I bake them in the oven instead of frying them? I turned 62 two days ago and still love corn dogs! Can't wait to try these! Mouth watering already! I am wondering if these would freeze well and then reheat well after? Thank you! 1. I bought Ball Park Angus beef hot dogs. 2. I pre cooked the hot dogs for 6 min. per side in a 350 degree oven. 3. I dried the hot dogs really well after I cooked them. 4. I made the batter and left out the pepper. I then put it in the freezer for 15 minutes. 5. I put the batter in a really tall glass to coat the hot dogs. The corn dogs turned out amazing. My husband ate three and said they were the best corn dogs he ever had. Thanks for sharing this recipe! You can also use little smokies. Can you add honey to make them honey flavored?